Before I get to the good of this post, I wanted to let everyone know I am hosting a giveaway. Be sure to check it out and enter! This week's edition of What the Hell Wednesday (created by the wonderful Christianna of The Girl With the Blue Bow - be sure to link up with her!) is a great opportunity to talk about natural products...or lack thereof. We use bath and body products numerous times a day but do we really know "what the hell" they are made of? I sure don't. But thanks to Alicia of Eco Natural Soap, I now have an idea. Check this out, as explained by Alicia: I Googled the ingredients on my bars of Dove, Neutrogena and my husbands Irish Spring. I was so amazed at what is allowed to go into the soaps we use. One of the things that I learned was that almost all regular bars of soap that we purchase have tallow, which is what comes from animals that are too sick to be used for food! The ingredients that we read were so disturbing to us that we threw out all of the soaps we were using and started buying all natural organic soaps. As a result, Alicia and her husband decided to open their own shop, Eco Natural Soap, and make quality, natural products. She was so kind and sent me a bunch of goodies to try out - which I happily did! Among the package was an Oatmeal & Honey Bar that I feel in love with. When using the bar, the oatmeal granules can really be felt and work as mini massagers. Plus the smell is nice and not too overpowering. I was also quite pleased with the "Lip Relief" All Natural Lip Balm in Natural Unscented. The balm is thick enough that you can feel it's working, but not too thick where it feels chunky on the lips (I hate that!). It also works quickly! I had chapped lips so I put the balm on at night and woke up to smooth skin. I asked Alicia why it's so important to shop natural and she explained: One of the reasons it is so important to take the time to shop with us is that all of our products are really truly natural, So many claim to be natural but if you check the ingredients thoroughly you will find that is not the case at all! Also we have made our all natural products very affordable. I agree! It's very impressive that all of the items are reasonably priced. Usually I assume that since it's all-natural it's going to cost a fortune. Not the case at all with Eco Natural Soap. Great prices AND free shipping. So there is no reason not to shop with them. 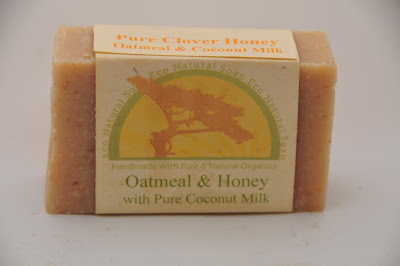 So head on over and browse around at Eco Natural Soap! Alicia and her husband are always adding new items to the shop. In fact, just since looking at the site last week I already see new goodies! And be sure to check out Alicia's blog, Eco Friendly Homemaking. I have been trying to use more natural products. Thanks for showcasing this! I am heading over to check out her blog and her shop! I really need to start using more natural products! Animals that are too sick to be used for food? DISGUSTING! This looks like a wonderful company I will have to check out. I definitely need to incorporate more natural products into my life... And I think this would be a phenom way to start! Oooh, that lip balm sounds awesome. I'm going to go check it out now! i love eco and organic products! i kind of dont want to use the bar of dove soap thats sitting on my sink right now! You're awesome my friend! Thanks for always linking up! This soap sounds pretty cool! i will definitely check out their shop. their products sound amazing! Natural is always better...great product! Thanks for letting us know! Green is great.